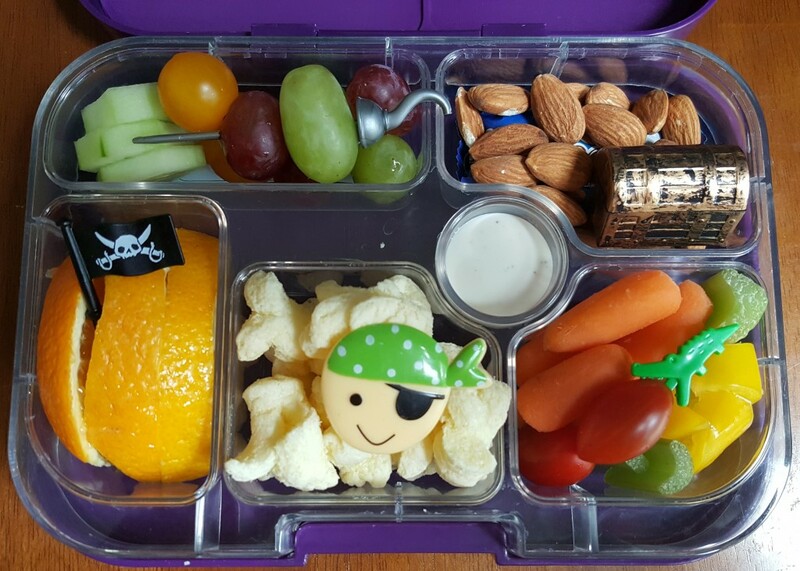 In the purple Yumbox, I packed cucumber slices, sunburst tomatoes, grapes, almonds, orange slices (to fight off the scurvy), pirate’s booty, carrots, celery, pepper slices, cherry tomatoes, and Ranch dressing. I added a Jolly Roger flag, pirate’s hook, pirate face, and alligator. 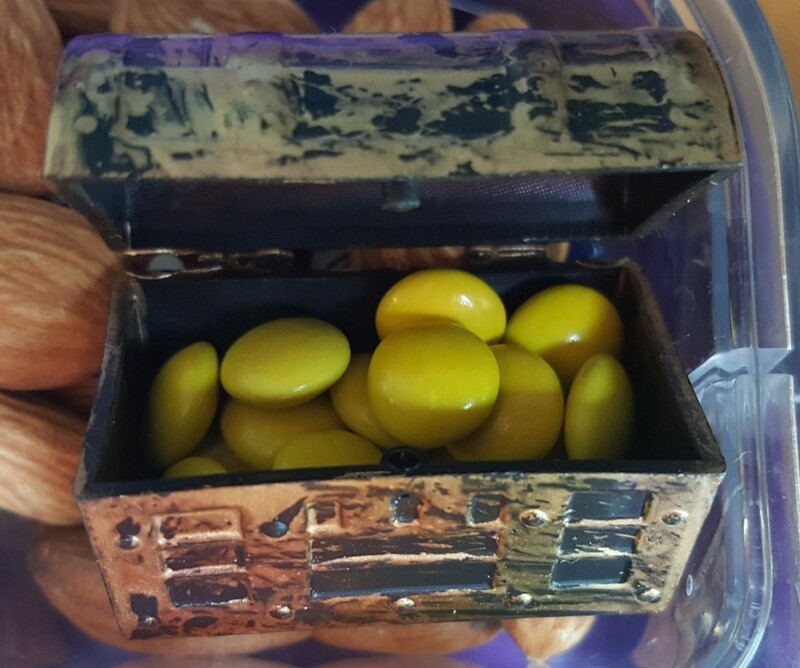 In the little treasure box, I placed yellow mini M & Ms to look like gold coins. 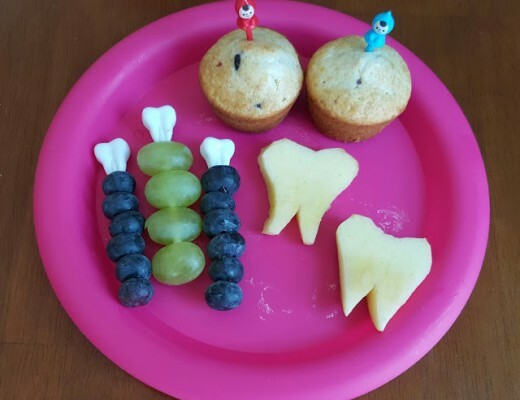 And below the almonds, I placed a mini Almond Joy bar – a treasure for my son to find in his lunch. 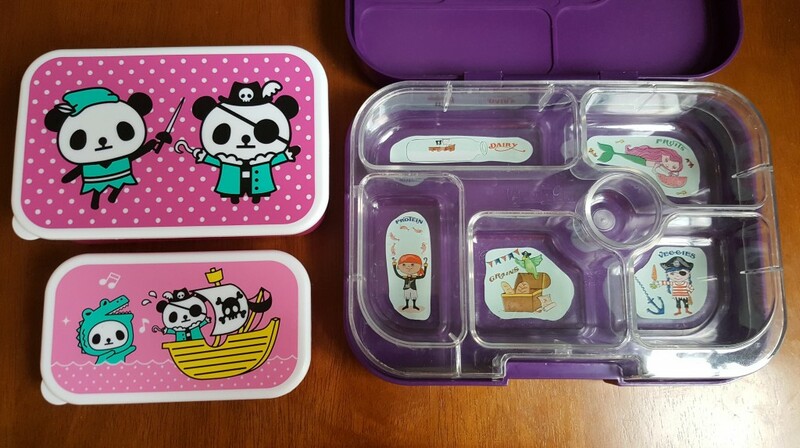 I think these mini treasure boxes are super cute. Here’s a picture of the box closed. 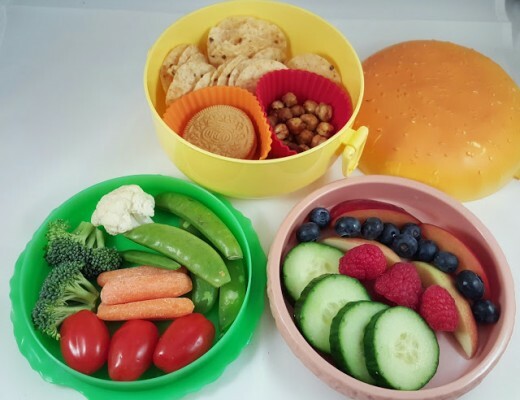 My daughter has similar foods arranged in two boxes with a slice of cheddar cheese instead of the Almond Joy bar. 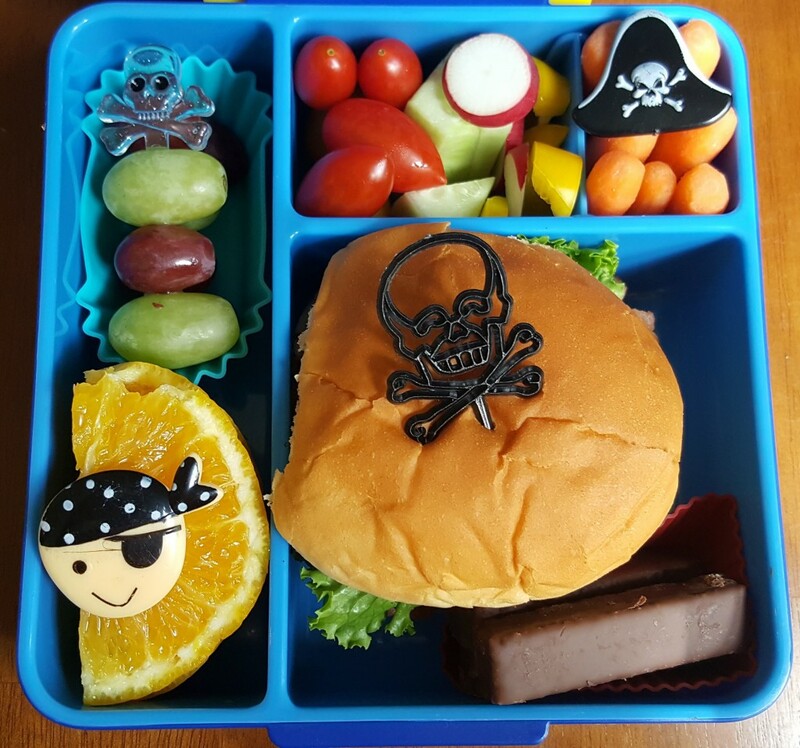 I also made pirate-themed lunches for work. My husband’s is below. 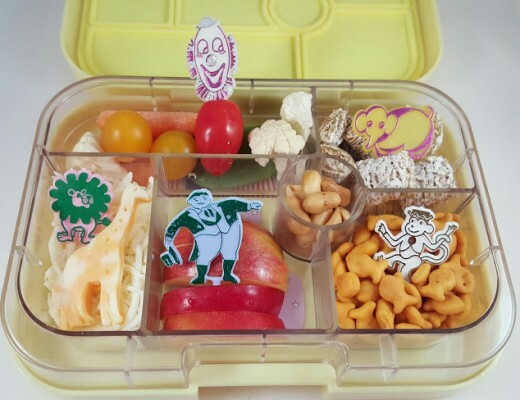 It is packed in our blue Omiebox. 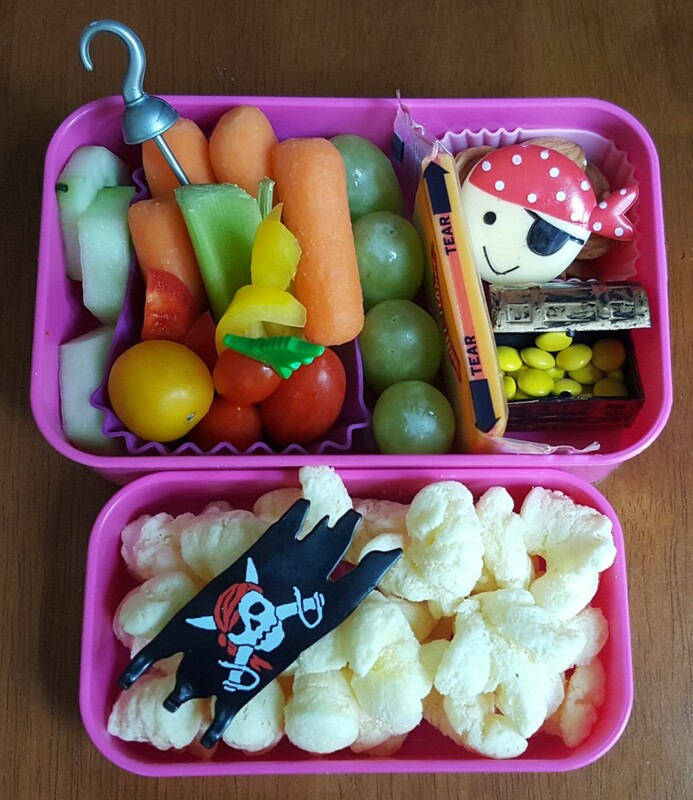 The left compartment holds oranges and grapes, the top section has lots of veggies, and the main section has a sandwich with blackened turkey, havarti, mustard, tomato, and lettuce. I also included a few fudge cookie bars. The pirate themes was easy to incorporate with a Jolly Roger picks, pirate head, and pirate hat. 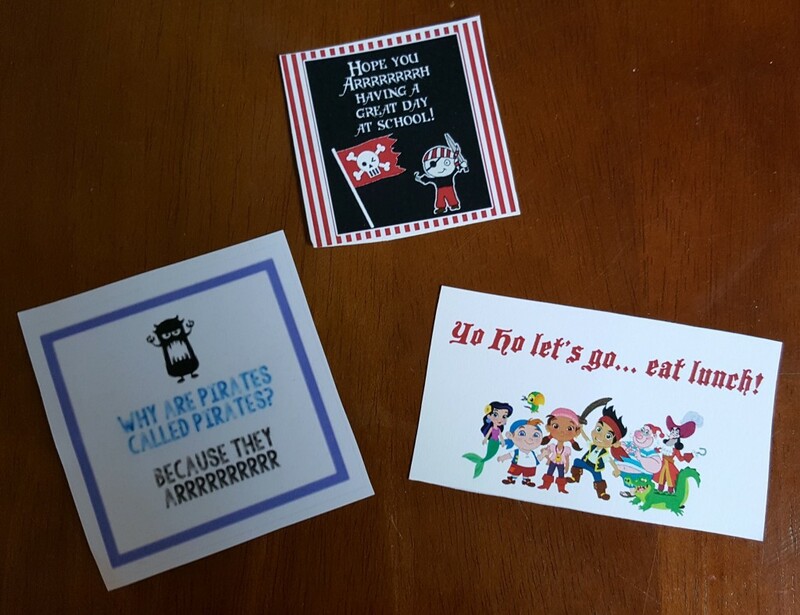 I have a collection of lunch notes on hand, so I flipped through those and pulled out three pirate-themed notes to accompany the lunches. The top one in black, red, and white is from A Pocketful of LDS Prints. The one featuring Jake and the Neverland Pirates is from The Delightful Life. And, the third one is from Wine and Glue. My kids and my husband seem to enjoy getting these notes at lunch; I add a little personal note to each person on the back. In anticipation of Talk Like a Pirate Day, we read some of our favorite picture books featuring pirates. 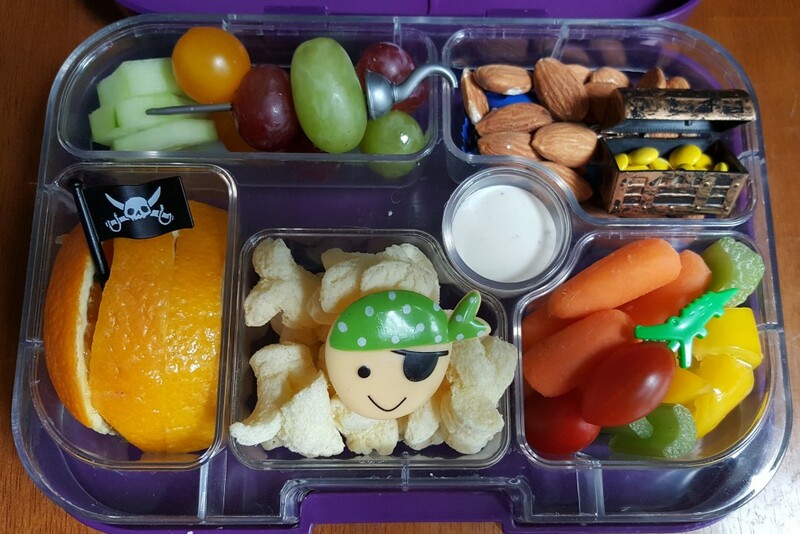 They are always fun and my son is really at the age where he gets a kick out of the funny pirate words. 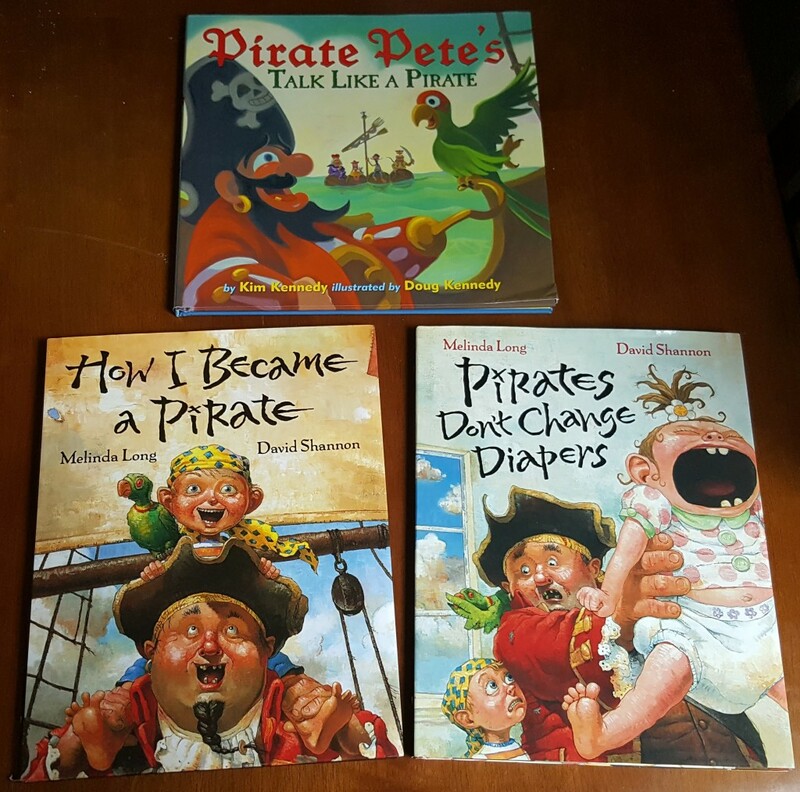 Today, Pirate Pete’s Talk Like a Pirate was the one he really laughed at. And both kids have fond memories of How I Became a Pirate and Pirates Don’t Change Diapers. We saw a children’s theatre performance of How I Became a Pirate a couple of years ago. 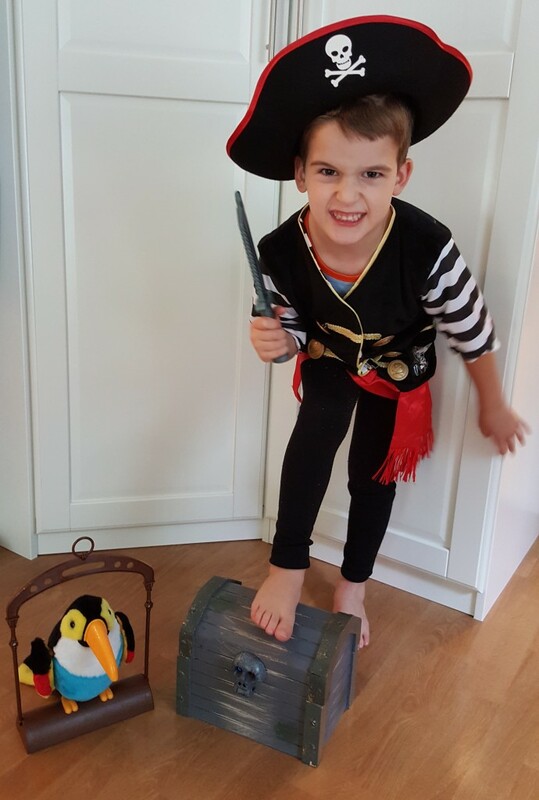 The books about pirates got my costume-loving son in the mood for some dress up. 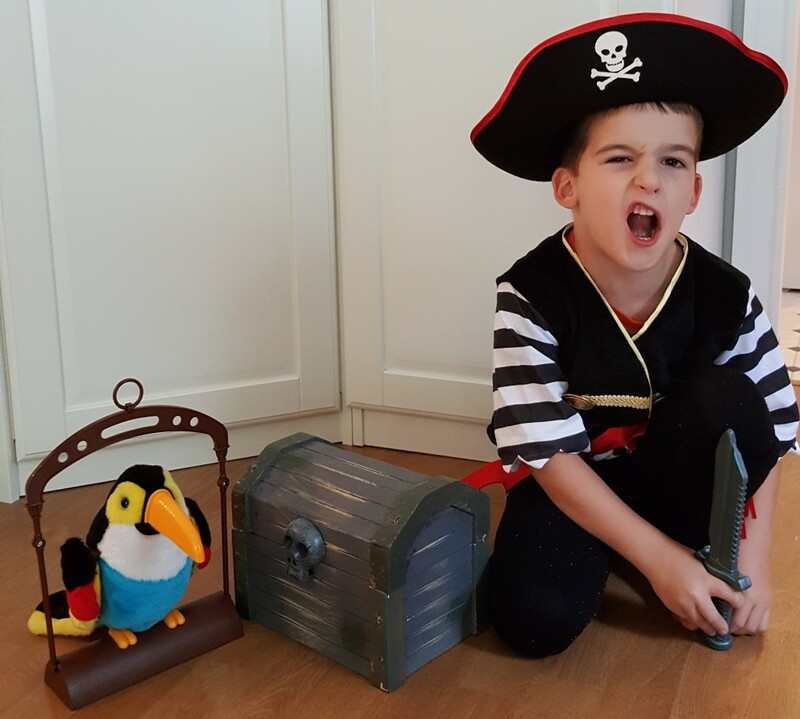 We dug out his pirate costume, he loaded up his treasure chest, and he rounded up the Talking Toucan he recently talked his granddad into buying. He and his sister then pretended to be pirates throughout the afternoon. Arrrrr Matey, enjoy Talk Like a Pirate Day!